It’s fair to say that I have been a bit slack recently when it has come to publishing race results. I blame this purely on the fact the club is expanding at such a fast rate with people running at events all over the place, it’s difficult to keep up! October was the last time I sent out a results round up, and no doubt there has been lots going on since then. There have been a couple of PECO XC events but I haven’t included them as there were so many club members taking part. I’ve also left out parkrun (as much as it pains me to do so as there have been some great achievements recently in regards to people getting a new PB and people completing their 50th/100th/250th event) as again there a lots of Nidds running every Saturday morning at Harrogate/Fountains Abbey/all over the globe, so once more it’s difficult to keep tabs on everyone. Latest set of results for your information. The Whixley 10k on October 28th was the 21st and final race of the 2018 Club Road Championship and we had a huge turnout. 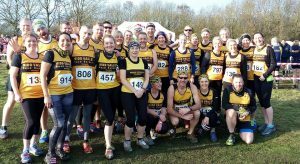 Sunday the 13th January saw 3 Nidds heading over to Haworth for a 6.2 mile 1,200ft race put on by Wharfedale Harriers. After struggling, bent double, across the car park to register and pick up our complimentary malt loaf we retreated to the car, watching others do the same and question our sanity. It really was a rather blowy. At least we weren’t on the Spine though.. right! We held out until 11.20 but then had to break out and into the quarry bottom to huddle up with 250 odd other hardy souls in the lee of an outcrop and watch the rain sheet across. At 11.30 we were away, out of the quarry and down the track. This race takes in wide tracks, narrow trods, steep banks and 5 river crossings (hence ‘splash’), this year it also took in gale force winds which often made forward progress difficult on the way out. But each cloud has a silver lining, and after turning about at the penultimate river, it was possible to get up some grand speed with the wind behind, the one time it was beneficial to run with your elbows stuck out, good sail! Jane in 208th in 1:22:51. Turns out she’d tweaked ankle early doors and commendably nursed it round. Normal service will be resumed once Boston is safely negotiated, I’m sure! Having said all that, times are frankly irrelevant as survival was the main aim of the day. After retreating to the pub for dry clothes, soup and a roll, tea, a cheeky half and a peer at the video of the race we’d just run (who ever said fell running was behind the times) we stayed for the clapping, got a load of confectionary chucked at us, and left several malt loaves and curlywurlys to the good. 3 Nidds were at the ALS at Haworth in the usually windy but unusually mild conditions. Sarah C 92.09 (and “happy as Larry” that she didn’t slide on her bum on the really steep bit. The MONTANE® Spine® Race is widely regarded as one of the world’s toughest endurance races. A truly epic challenge that will test your physical resilience and mental fortitude. Racing non-stop along the most iconic trail in the UK, the Pennine Way, you will experience the full intensity and ferocity of the British Winter. From Edale to Kirk Yetholm. Matt Wilkinson made it to the start line in Edale for this epic 268 mile race but after (an impressive) 50 miles he retired. The winner of this race was Jasmin Paris. Look her up as she is an amazing human being. She completed the course in a record time of 83 hours 12 minutes and 37 seconds. A course record and unfortunately takes the women’s course record previously held by the one and only Carol Morgan. This one is just 108 miles, from Edale to Hadraw and was taken on by Carol Morgan and husband Simon Franklin. Carol was Carol and smashed it. She completed the course, taking first woman and 6th overall in a staggering 31 hours 47 minutes and 37 seconds. Simon trailed in after Carol in 39 hours 42 minutes and 2 seconds. Both are truly remarkable athletes and deserve a massive lie down. Good evening, here are all the latest club results. It’s been a few weeks since I last sent any out and there has been lots going on. I haven’t included any parkrun times due to the number of races over the last three or four weeks. These aren’t in any particular order and hopefully everyone who has raced has got a mention……. This is a new multi terrain 10km race starting and finishing in the picturesque village of Bishop Monkton and raising funds for the local primary school. Although it’s not in the club champs, it’s great to support a local event and hopefully there will be many more in the years to come. Cath Barber & Phil Ventress, Lee Welsby & Simon Harris, FRP Robinson & Chris Beattie, Carol Morgan & Luke Wakelin. The team put in a cracking effort to finish in a total combined time of 6:27:08. A local ultra-event encompassing the likes of Fewston, Swinsty and Scargill reservoirs along its 35 mile route. With roughly 3100ft of climb during the race, it’s a challenge for even the most experienced runner. Luckily Nidd Valley had sent its ‘elite team’ along for this one! The annual bus trip to Brid was once again very successful, and the cold start in the morning made way for some brilliant sunshine for the race. Conditions for the half marathon were almost perfect, and there was a good contingent of black and gold vests in and amongst the 400 or so runners taking part. Everyone seemed to enjoy themselves and we even had representation at the 1 mile fun run! People always do this race, say they hate it, and then come back again the following year – there’s no real explanation for this, it just happens. This year’s event was no exception as many a hardened Richmond veteran returned to have another crack at the ‘undulating’ course, with the cobbles near to the finish at the castle entrance extra greasy this year as it rained pretty much all day. Considering it was the weekend of the York marathon, NVRR still managed to get 18 runners to this one. A great effort all round considering the dire conditions! Running a marathon is a challenge for anybody, regardless of their experience or fitness. The time and effort that is put in by an individual to prepare for race day is a true show of commitment, and can push people to their limits. Race day itself always comes around quicker than expected and a fitful night’s sleep is pretty much guaranteed beforehand, and the day will present other unexpected challenges that one cannot simply prepare for. The weather last Sunday at York was not ideal to say the least, certainly not for running 26.2 miles in, but people did, and they finished. From our club, we had 8 runners who all ran brilliantly – I’m sure they will share with you their own experiences of the day, both positive and negative! A cracking route by all accounts – runners are unsupported, and there are three decent feed stations along the way. Again the (very wet) weather played a huge part in this event, so much so that the race was delayed for a while at one point due to a river bursting its banks! A diversion had to be quickly sorted out by the organisers and the runners were on their way again after about 25 minutes. Carol Morgan naturally took these conditions in her stride, finishing as 2nd lady in a total time of 14hrs 11 mins 14 secs. There were various distances to choose from at this event organised by Its Grim Up North Running. Fozzy Forster ran the half marathon event and finished in 2:11:11, while in the 20 mile event, Jeremy Scott crossed the line in 3:51:59. Also running in the 20 mile event was Matt Wilkinson – he finished in a time of 2:26:36, finishing in 1st place!! 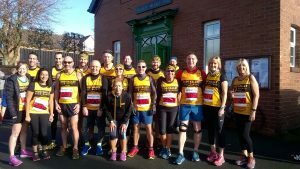 At the Chester Marathon, Andy Todd put in an absolute storming effort to finish in 2:59:11 while at the Grewelthorpe multi terrain race Mark David finished in 70:28 and Sarah Chalmers in 1:03:52. James Braddon finished 6th overall at the Beeston 10k in a time of 43:12, while FRP Robinson was the sole Nidd at a very wet Rombalds Romp fell race in Ilkley, finishing in a time of 1 hr 25 mins. Here are the latest batch of club results, everyone has been really busy again over the last few weeks producing great results. In the highly unlikely of me missing somebody out or not mentioning a race that occurred, please send me the appropriate feedback so I can rectify any issues………. This club championship race was described as fast and flat by the organisers, and judging by the number of PB’S achieved the description holds true. NVRR had 28 runners making the short jaunt over to Tadcaster for this event, and the weather remained favourable despite a momentum sapping headwind at about mile 7. First back for the club was Capt. Martin Lofthouse in 1:07:12, with Kevin Dalton not too far behind in 1:09:12. I followed in 1:11:30, and then Brian Hainsworth was next in 1:13:41. Emma Dooley was the first Nidd lady home, crossing the line in 1:16:09, while Becky Barron was next in 1:16:18. Dave Shores was next in 1:17:11, then Phil Ventress in 1:17:14. Jane Evans grabbed the first PB of day by finishing in 1:17:46, followed by Sue Simpson who finished in 1:19:46. Knocking 8 minutes off her previous 10 mile time, Sarah Hughan’s marathon training continued to pay off as she finished in 1:20:10, encouraged along by Jamie Dilasser who crossed the line in 1:20:09. Michael Benson was the next club runner to get a PB as he finished in 1:20:31, and John Mitton was next in 1:22:42. Emma Kettlewell finished in 1:24:25 and achieved a PB (and she got herself her a new parkrun PB the day before! ), followed by Jeremy Scott in 1:24:25. Christine Jones brushed any injury doubts to one side as she got herself a new course PB of 1:25:22, with Debbie Gibson next in 1:28:24. Yvonne Skelton was 1st F65 (no such category at Tad, but it’s a great achievement so it’s worth a mention) and finished in1:29:17. Christina Taylor was next in 1:32:39, followed by Hannah Peagram – running her first race since recovering from injury – who finished in 1:35:48. Robert Hill was next in 1:36:07, and achieved 3rd M70, followed by Jane Wilkinson in 1:43:30. Michelle Smith crossed the line in 1:44:15, then Colleen Gruenwald in 1:46:19. Graham Hyde was the next Nidd to get a new fastest time, as he crossed the line in 1:49:46, with Sylvia Morten next in 1:53:15. Former Zip to Zoomer Fiona Cunningham put in a strong performance to finish in 2:04:27 and getting a new PB for her efforts! On Saturday 15th September, there were new PB’s at Harrogate for Michelle Howe in 22:05 and Jane Evans in 22:29. At Fountains Abbey Emma Kettlewell achieved a new PB of 24:18, while NVRR junior Liam Escott got his fastest time at Wetherby, finishing in 20:34. There was more parkrun tourism going on – Andrew Johnson was at Roosevelt Island DC and finished in 32:25, Matt Wilkinson finished 1st at Wycombe Rye parkrun in 18:14, Steve Newton at Woodhouse Moor 25:23, Phil and Fiona Robinson at Ludlow, 26:20 and 35:50 respectively. New Earswick was visited by Amanda Schofield who finished in 33:16. Last Saturday saw Colleen Gruenwald take part in the Heritage Harbor parkrun, Ottowa, Illinois where she finished as 2nd female in 27:30. It was a two hour drive for Colleen to get to this parkrun – that really is dedication on a Saturday morning! Iain Scott got a new PB of 24:36 at Harrogate, at Fountains Christine Holleran ran a PB of 22:43, while NVRR junior Beth Whiley also got her fastest time there, finishing in 28:19. Sarah Chalmers ran the Embsay Fell Race and finished in 43:03, while Nicola Smith tackled the Berlin marathon, crossing the finish line in a very decent time of 4:42:46. Another club champs race, a short one but very local. Many thanks to Knaresborough Striders for putting on a great event (with lots of cakes). Good afternoon, here are the latest club results. A popular local race attracting up to 1000 runners, the Wetherby 10k this year was challenging due to the warm weather. NVRR managed to have a good turnout, 24 in total! This event was a bit of an alternative for those not doing the Great North Run, it was a bit more local but still provided a challenge. This is another popular event, a classic off road event run under FRA rules (taped seams again, and you need your own mug for brews). It starts and finishes at Howarth primary School so there are plenty of hills to get stuck into. Chris Beattie ran the full 26.2 miles in a time of 5:12:31,and bagged 1st MV60 in the process.Jim Cook also ran the full in 5:11:12. Sarah Chalmers sensibly stuck to the half marathon distance and finished in 3:40:27, as did Christine Holloran who finished in 2:47:04. Matt Wilkinson was running in the pairs event on behalf of Skyrac AC, his second claim club and finishing in 4.17. There were PB’S at Harrogate for Ben Baird in 18:44 and Mike Benson in 22:01. At Fountains Abbey– John Beaumont got a new PB 20:20, as did NVRR junior Jessica Beaumont in 27:56. At Chester parkrun, Lorna Eley finished in 27:35, Adam Kirk finished in 2nd place at Pontefract in time of 18:21.Fælledparken parkrun (Denmark) – Yvonne Skelton 26:25, Martin Weeks 28:59 were at possibly the best named parkrun – Fælledparken in Denmark. Yvonne finished in 26:25 and Martin in 28:59. Last Saturday, Matt Wilkinson got 1st place at Harrogate with time of with 17:36, while there were new PB’S for Emma Kettlewell in 24:19, and Jeff Walker in 25:38. Plean parkrun Colleen Gruenwald went to Plean parkrun and finished in 29:05, Andy Harris was at Fort William and finished 2nd overall in 20:48, and continuing their tour of Scandinavia, Yvonne Skelton and Martin Weeks ran at Malmo Ribersborg parkrun in Sweden. Yvonne crossed the line in 26:32, and Martin in 29:53. In other races, Jane Hill finished the Hardmoors Princess Challenge – no results published for this yet, while Catherine Barber ran down a 1 mile mountain bike downhill course TWICE to finish 8th lady overall at the Yorkshire Downhill Time Trial at Havok bike park near Todmorden. Sarah Chalmers and Jane Evans ran at Burnsall Sports Fell race, Jane finishing in 30:11 and Sarah in 46:40. That’s all for now, well done everybody! Good evening, it’s been a busy few weeks with lots going on, people on holiday etc, but fear not – the kids will be back at school soon and the days will be getting shorter. It’s nearly time to dig out the hi viz and head torch! In the mean time, feel free to peruse the latest batch of race results. What a splendid bunch you are. If you would like a mention in these write ups then please let me know about any recent races/events you have been part of. Drop me an email or contact me via the Facebooks. Staying in the fells, FRP and family have been hitting more trails and hills recently. Phil and Alex braved some awful weather to take part in the wonderfully named Kong Mountain Marathon in the Lakes – a 4 hour score event with plenty of climb involved. Out of 174 runners braving the elements, Alex finished 62nd overall (and 1st M23!) while Phil was 71st overall. Alex’s effort included 13 miles with 4500 ft of climb, and Phil 11 miles with 3500 ft of climb. Another event they have recently taken part in was the Country Trail Races, which are all 6 miles in distance and competitors follow typed instructions after setting off at intervals. Fiona and Phil tackled the Calverley Chase on 15th August, then Phil, Fiona and Alex had a go at the Forge Frolic on 22nd August. At Harrogate on 11th August, Sarah Hughan’s marathon training paid off as she got herself a new PB of 23:03, Adam Kirk got a new PB of 18:39 at Temple Newsham. There was also a bit of parkrun tourism as Nidd junior Ben Rosie (24:48) ran at Fell Foot, Newby Bridge, while another junior, Beth Whiley, ran at Lytham Hall (28:18). At Crosby parkrun, the club was represented by Yvonne Skelton (26:52) and Martin Weeks (29:08). The tourism continued on Saturday 18th August as Collen Gruenwald ran at Perth (26:20), Nidd junior William Reid at Sheringham (23:50), Mark Armstrong at Keswick (23:34), Tony Chapman at Peckham Rye (28:35) and Lorna Eley ran at Heslington (38:29). At Fountains, Alex Leslie achieved a new PB of 23:18, while at Harrogate there were new PB’s for Kevin Dalton (20:13), Jane Evans (24:20). Last Saturday saw Adam Kirk finish in first place at Horton Park, Bradford in a time of 18:02, while parkrun tourism was still in full flow with Nadene Wilkinson finishing 26:28 at Brockwell, Herne Hill, and Steve Turner at Prudhoe, crossing the line in 20:52. NVRR womble representative Sam Fugill was at Wimbledon Common, and he finished in 27:04. Jeff Walker took part in this 25 mile event organised by the Yorkshire Coast LDWA. 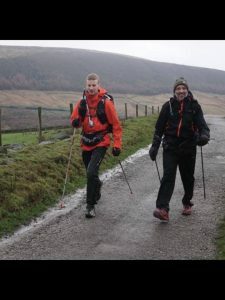 Fully armed with maps and snacks, Jeff had a crack at the route of ‘modest undulations’ that saw him tackle the lovely area around Robin Hood’s Bay and Fylingdales Moor, and he finished in a great time of 7 hrs and 48 minutes! Well done Jeff, cracking effort……. I believe most of us at the running club are familiar with the local Punk Panther Ultra marathons, they all start and finish around Otley and Pool, all have varying distances over routes in and around the Leeds/Harrogate/Bradford area. A few of our runners have taken part in these events over the last couple of years, they seem to enjoy themselves as they keep going back for more! The Urban Legend Ultra is substantially offroad, but takes you right near to the heart of Leeds visiting many of the public greenspaces during the course. It is based on the North West Leeds Greenway. Starting in Otley climbing sharply over the Chevin via Suprise View to Guiseley, Yeadon, Rawdon, Horsforth, Hawksworth Wood, Kirkstall, Burley Park, Headingley, Hyde Park then along the Meanwood Valley Trail through Adel Woods to Eccup Reservoir, Golden Acre Park, Paul’s Pond, Cookridge, Bramhope back into Otley, before finishing in Pool-in-Wharfedale. Matt Wilkinson was up for this, he was leading it pretty much all the way round before someone out-sprinted him right at the last stretch! Matt finished in 6:54:43, 2nd overall so it wasn’t a bad effort…….